Join us for our first-ever live webinar on Wednesday, September 15, 2010 at 2:00PM EDT. 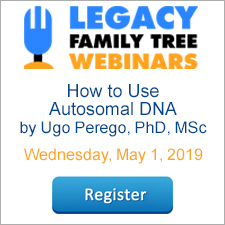 The webinar, Mapping Software for Genealogists will cover essential software tools: AniMap (U.S. & Canada), Centennia (Europe & Middle East), and Map My Family Tree (entire world), and maybe even a Legacy Family Tree tip or two. 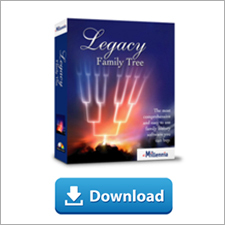 Join Legacy Family Tree's Geoff Rasmussen as he demonstrates these powerful software programs. If you have questions that you would like answered during the webinar, send us an email. Geoff is the presenter of the Legacy Family Tree learning CDs. After you register you will be sent instructions, including your private link to view the webinar online. You will need to be connected to the Internet (high speed connection recommended) and turn on your speakers. That's it! All attendees have a chance to win a door prize. We might even throw in a special coupon too for use in our online store. Whatever your incentive is to attend our first-ever live webinar, we look forward to seeing you there. U.S. and Canadian researchers will be excited to hear about a major update to the AniMap software. We've written previously about the importance of AniMap in Why You Might Have A Brick Wall and I hope you are not doing U.S. research without this . . . . The SiteFinder database has been expanded by more than 250,000 places including some new categories: Civil Divisions (Townships, for example), mines, parks, islands and more. Bigger maps. Maps can now be expanded to 1280x960 resolution which will fill most of the larger screens. The help files have been expanded and cover every aspect of using AniMap in non-technical language. In addition, a PDF file containing an instruction manual is also included which you can read before beginning to use AniMap. Current AniMap users can upgrade to version 3 by clicking here. For more information, or to purchase AniMap, click here. To see an overview of AniMap, click here. Introducing SiteFinder Online, a free web-based version of The Gold Bug's SiteFinder U.S. place name database. SiteFinder Online lets you search for towns, cemeteries, schools, courthouses (and more) and plot them onto Google Maps where you can zoom in & out or overlay the SiteFinder locations onto satellite images of area you are studying. You can plot multiple items at once, or search for your exact point of interest. In addition to the more than 700,000 current locations, there are thousands of historical locations that no longer exist and won’t be found on current maps. The database contains all the locations contained in the version included with the AniMap County Boundary Historical Atlas software. The search capabilities are a little more limited, but are sufficient for this application. You may access this free service at www.goldbug.com/map/sitefinder.html. AniMap contains over 2,300 historical maps that show the changing county boundaries for each of the 48 adjacent United States for every year since colonial times. Its use is essential for research in the U.S. I hope you are not doing U.S. research without this . . . When I first began my research, I looked in the records of Franklin County, Idaho for the birth of my great-grandfather, who was born in 1890 in a small area called Mink Creek. I wasn't very successful because at the time, Mink Creek was not located in Franklin County. In fact, Franklin did not even exist at the time. Had I known about AniMap, I never would have looked in the wrong jurisdiction. AniMap allowed me to plot Mink Creek on the map, select the desired year, and it showed me what Idaho's county boundaries looked like in 1890. Mink Creek was definitely in Oneida County. However, changing to the modern map's boundaries, I understood the mistake I made. Today, Mink Creek is in Franklin County, but records of his birth would have been in the old county. If you are doing research without understanding the right jurisdictions for the time period, your research may end with a brick wall. Watch a FREE video preview of AniMap by clicking here. A new file is now available on the AniMap update page. A new version of COMAPS.EXE fix a couple of problems plus allowing space for future expansions of the information in the county database. Visit the update page at http://www.goldbug.com/AniMapUpdate.html. The files on this page will only work with AniMap version 2.6 or higher (there isn't one higher yet). Once you have downloaded the file, cut an paste it into the main AniMap folder. If you have done this correctly, Windows will give you a message asking if you want to replace the old COMAPS.EXE with the new one. Click on OK and you are done. Those who do not have AniMap 2.6 can upgrade for $39.50 plus $3.00 shipping/Handling. To order, go to http://www.goldbug.com/store and click on the AniMap Upgrade link. Also learn more about AniMap by clicking here. Users of AniMap will benefit from a new training video CD entitled Plucking, Plotting, and Places: a Video Tutorial of AniMap. The tutorials teach the ins and outs of AniMap and include written step-by-step instructions. Developed by Millennia's Geoff Rasmussen, the instruction helps overcome AniMap’s learning curve and teaches genealogy methodology at the same time. AniMap has long been known to be the best resource for understanding the changing country boundaries in the U.S. and parts of Canada. Learning how to use it has been the researcher’s challenge. The video plays on the computer, so it’s easy to switch between it and AniMap to learn. For a video preview of AniMap, click here.